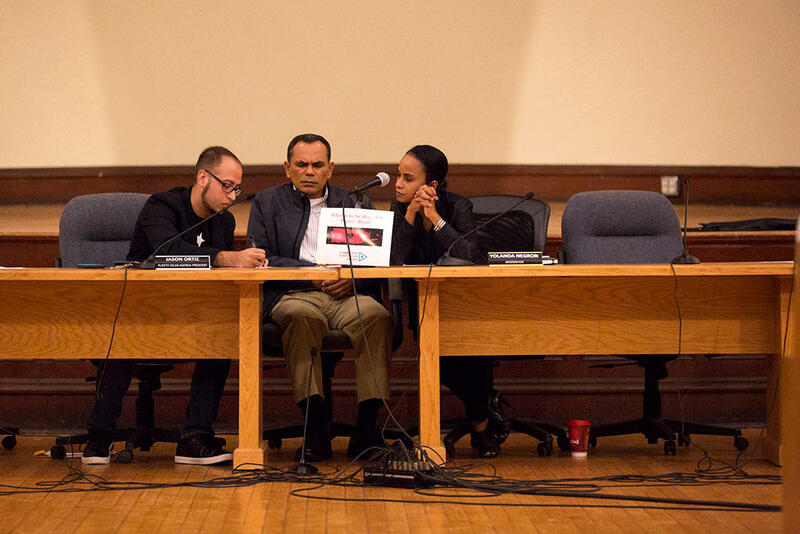 Pedro Bermudez, middle, spoke at a forum on the future of Puerto Rico with daughter Wildaliz (right) at Windham Town Hall on October 25. The early morning hours of September 20 were probably the most traumatic of Bermudez’s life. Hurricane Maria made landfall in Puerto Rico that day—just southeast of Yabucoa. That’s where Bermudez and Hernandez have a house. “Sad to say, I’m 53 years and in all of my whole life, I’ve never seen anything like that,” Hernandez said. Hernandez said they protected themselves from the storm by lying at the foot of the bed. She said the wind started to blow around 2:00 am. Then, she said there was a break in the storm at 5:00 am. That’s when she and Bermudez approached the door to have a look outside. “As soon as we opened that door, my tears came out because the beautiful island that we just had moved to was gone,” Hernandez said. The trees that they planted were gone. The one part of their home that wasn’t cement, the laundry room in back, was also gone. Supermarkets were empty. Banks rendered useless. Because of all that, they’ve been forced to move back to Hartford—weeks away from the cold of a New England winter. Bermudez spoke at Windham Town Hall on October 25. 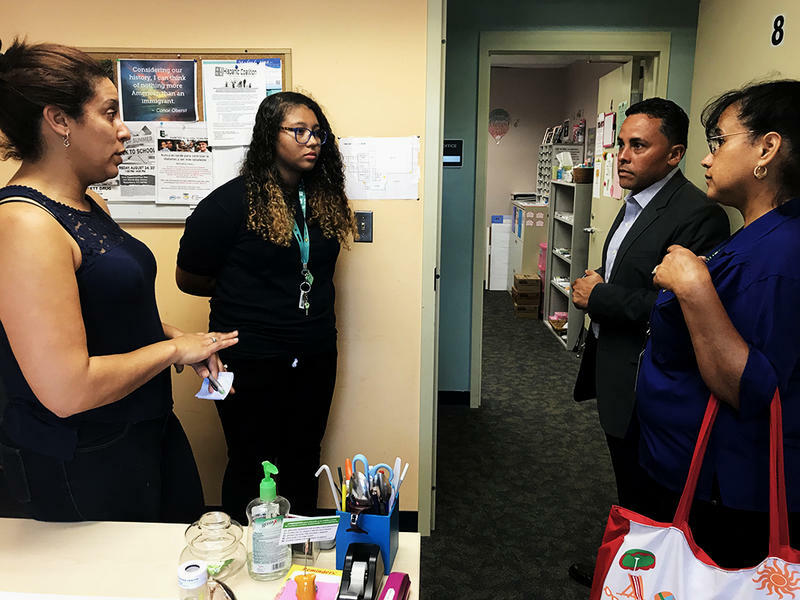 Pedro’s daughter Wildaliz Bermudez is a Hartford city councilwoman. She’s also part of the Connecticut Puerto Rican Agenda. The group hosted a forum that night aimed at answering questions that concerned citizens had about the future of the island and the recovery effort. Wildaliz invited her father there to speak to the crowd. 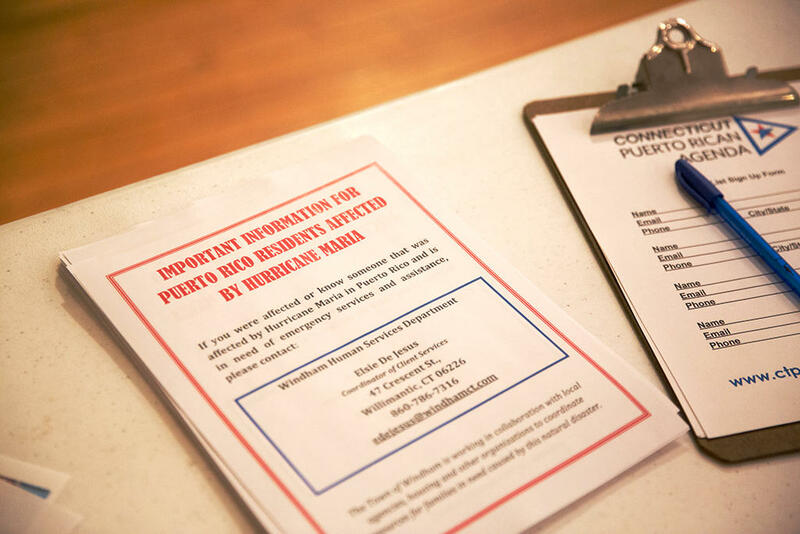 At the forum, handouts were provided to people directly affected by Hurricane Maria. Contact information was included so that those affected could inquire about various social services. Pedro also hopes that his story could get a response from the community. It hasn’t been all bad for the Bermudez’s—Pedro Jr. got married a few weeks ago and now in Connecticut, Pedro Sr. gets to spend time with Wildaliz’s five-month old child. He said those things give him and his wife a lot of hope. Marie Degro was the first student to arrive at Crosby High School in Waterbury from Puerto Rico in the aftermath of Hurricane Maria. Nelson Robles, 56, is the maintenance man at Primera Iglesia Bautista Emanuel church in downtown Bridgeport. He’s also a percussionist during mass. 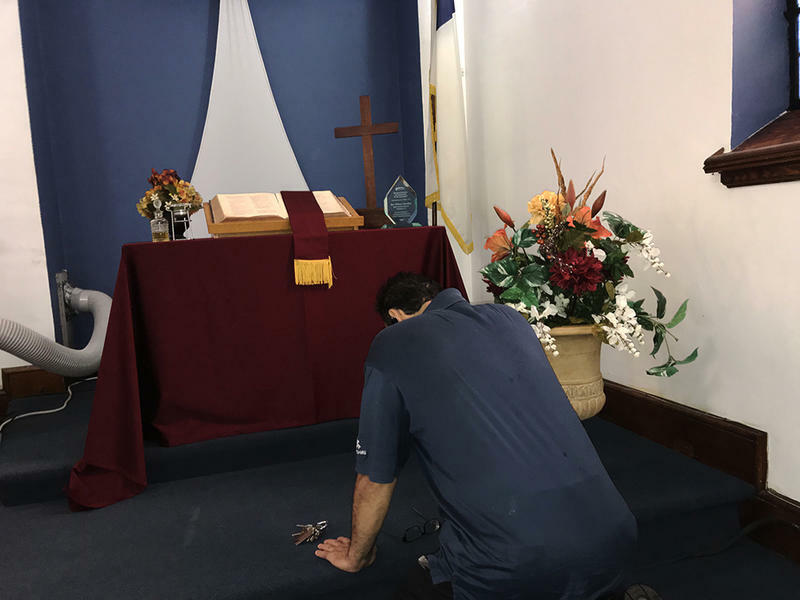 Every morning, he walks to the corner of his church – just off the altar to the right – and prays. He said that while he’s down on his knees looking for guidance, he feels God.